Online news sites try to strike a balance between encouraging open communication among readers and maintaining a civil tone. (CNN) -- User comments on news sites, while vital to interactive storytelling in the digital age, often read like scribblings on a bathroom stall: anonymous, offensive and full of hate. "I hate what you people, and by that I mean the blacks, are doing to this city," wrote one Buffalo News reader last month in response to a story about a local shooting. "Each area you move too [sic] quickly becomes over run [sic] with crime, loud music [at] all hours, adults swearing and screaming at kids, children playing in the street, porches with beer and garbage thrown all around." Rants like this one prompted the Buffalo, New York, newspaper to discontinue anonymous user comments on its website as of August 2. Commenters will be required to register with their name, city of residence and phone number -- more information than most news sites require -- and staffers will attempt to verify their identities. "It is the ability to remain anonymous that encourages people to say whatever they want [online] ... when people are required to give their names, our thinking is that they'll think twice," said news editor Margaret Sullivan, who added that vetting commenters will be a "challenging" task. "There might be people who slip through the cracks." Like those bathroom-stall messages, online comments on news stories can be difficult to police. For years, many publications have tried to strike a balance between encouraging open communication among readers and maintaining civil discourse. But a few sites, fed up with rude or inflammatory comments, are taking bold new steps to raise the level of dialogue. The website of the Sun Chronicle newspaper in Attleboro, Massachusetts, launched a new system July 7 that requires commenters to register with their names, addresses, phone numbers and a credit card number. Users are charged a one-time fee of 99 cents, activating their accounts; commenters' names and communities, based on their credit card information, appear beside their posts on the site. Although only 22 people had registered to comment on the site as of Friday, Sun Chronicle editor Mike Kirby said the paper, which has a circulation of about 15,000, has received as much praise as criticism over the new system. "I can't guarantee this is going to work, but I know for sure it seems to improve the discourse online and it will certainly bring some responsibility and consistency," he said. Or will it? While anonymity often serves as a scapegoat for inflammatory comments online, journalism observers say it's only one piece of a larger puzzle. "The question of anonymity is definitely something we should think about, but I don't think that's the only element when you consider productive user commenting," said Steve Myers, managing editor at Poynter Online, a website run by the nonprofit school for journalists. Users also sometimes need to be reminded of a site's commenting guidelines before they post, Myers said. "It's important to tell people what you're looking for," he added. Also, drawing attention to an insightful comment that helps move the discussion forward -- something Myers refers to as "hoisting a comment" -- lets users know their posts, especially the thoughtful ones, are valued. In the competitive world of online news, many sites encourage comments as a way to create a conversation with users and to measure which stories resonate most with audiences. On the most popular sites, it's not unusual for a story on a hot-button topic -- politics or immigration, to name a few -- to attract more than a thousand comments. "As a writer, I love the instant feedback. It makes the site a two-way experience," said Arianna Huffington, co-founder and editor-in-chief of The Huffington Post, in an e-mail to CNN. "People no longer want to just passively sit back and be served up information. We now engage with news, react to news, and share news. News has become something around which we gather, connect, and converse." Many sites don't require readers to attach their actual names to their comments, but the majority of sites have, at least, implemented some kind of soft registration -- requiring that readers supply a valid e-mail address and username to comment. Though this extra step can improve the discourse, sites are beginning to realize it isn't ridding comment boards of hateful and offensive speech, Myers says. But taking away commenters' anonymity might not be the answer, he added. The Huffington Post, which gives commenters the option to remain anonymous, launched "HuffPost Badges" in April. The new system "allows the HuffPost community to more actively participate in the comment moderation process," Huffington said. The system, which awards badges to commenters who post frequently and flag inappropriate comments, "has helped make us a more dynamic and interesting site, while keeping the conversation civil," Huffington told CNN. "[Anonymity] is fine, as long as [users] maintain a civil tone -- something we have worked hard to ensure through comment moderation." The debate over inflammatory online comments always seems to boil down to whether users should be allowed to post anonymously. Some industry observers say many people would be reluctant to comment without the promise of anonymity, which encourages candor. "By allowing anonymous comments, you're going to get things and information that otherwise would not come to light," said media lawyer Robert Bertsche, who represents the New England Newspaper & Press Association. For example, if a commenter is working at a company where criminal activity is taking place, there's great social value in that person speaking out -- and they're far less likely to do so if they can't post anonymously, he said. Others argue that anonymity protects irresponsible or even dangerous commenters. "With no name attached, the commenters basically wear a hood and swing a sharp axe," said Robert Steele, director of the Janet Prindle Institute for Ethics at Depauw University. "The intent in allowing and encouraging these comments online is to increase page views and time spent on the site. It's a business motivation." Sullivan of the Buffalo News predicts the paper is likely to see a smaller number of people commenting once the new system goes into effect next month. But she believes it was the only logical next step toward cleaning up the site's reader forums, and she hopes the comments that stories do receive are more thoughtful. Some Buffalo News users have already expressed concerns for their personal safety if their names and hometowns are posted along with their comments. Wrote one user, "I'd rather not take the chance that some lunatic does not agree with my point of view and tries to tell me that face to face." But this isn't a problem for many online readers of The Wall Street Journal, who under site policy have been posting comments with their real names since 2008. "Real names help [improve the discourse] but it's also about the community of people who are attracted to the content ... certain types of content are more likely to attract people who violate our terms of service," WSJ.com managing editor Kevin Delaney told CNN. The Journal is able to verify many commenters because subscribers register with their real names and credit card information. However, people who register for free are on the honor system. "People slip through with fake names, but our commenters, with some frequency, do flag those for us," Delaney said. Jean Balloon, whose comments have been recommended on the site more than 500 times to date, says she's gotten death threats from other commenters in the past. "Die and die quickly," read one of the threats, about a comment she posted on a story about BP and the Gulf oil disaster. But that hasn't stopped Balloon from posting her honest opinions online. "The opportunity to post your ideas and beliefs far outweigh a few crazy people," she told CNN. "I try not to live my life in fear." The future of online comments? Though soft registration, and requiring readers to provide their real names, still hasn't managed to completely clean up comment boards, there is one technological advance that Bill Adee, vice president of digital development and operations for Chicago Tribune, says significantly reduces the amount of hate speech spewed by commenters. "As we implement registration that's tied to people's social media profiles, that helps raise the level of discourse on the comment boards," Adee said. "Nobody is going to drop an f-bomb when their grandma can see it on Facebook." From requiring users' full names and phone numbers to linking user comments with Facebook accounts, news sites are approaching this issue in many different ways. And that's OK, said Myers of the Poynter Institute. "I don't see there being one approach that's going to work for everyone," he said. And online comment systems will only continue to evolve. Myers predicts that sites will move beyond banning certain users from commenting or asking readers to flag irresponsible comments. In the near future, journalists will be asked to get in on the action by monitoring and, at times, taking part in the discussion about their stories, he said. Some beat reporters and bloggers already do this. By entering the comment threads and asking questions of their users, they can help lead the discussion, Myers said. Journalists "aren't trained on how to interact with their audience," he said. "This idea is fairly new ... [they're] going to have to think about publishing as not the end of the process, but as one step." In Buffalo, Sullivan believes her site's new system will at least encourage users to be more civil. But even she is not entirely sure if will yield the results the News is hoping for. "That's the whole thing about the media in the Internet age," she said. "We're just throwing a lot of things up against the wall to see what sticks." 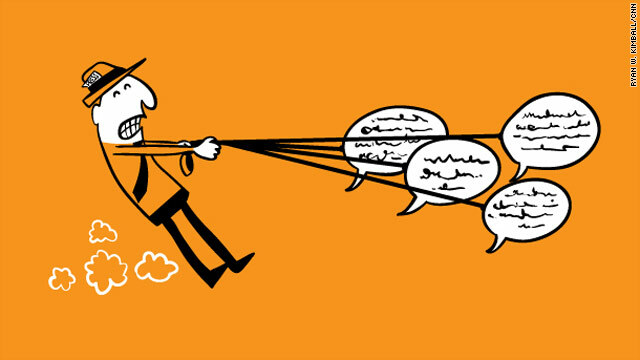 So what do you think about online commenting? How important is the option to remain anonymous when posting to comment boards? Is there a better solution? Let us know in the comments below.